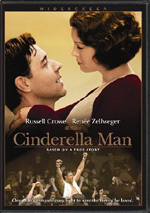 Cinderella Man starts in 1928 and introduces us to rising star James J. Braddock (Crowe). The boxer is on the upswing and looks ready to challenge for the title. Unfortunately, Braddock starts to lose, some injuries make things tough for him, and the Depression robs him of his investments. After a quick intro to Braddock on the rise, we join him in the depths of financial despair and see how poverty impacts on Braddock, his wife Mae (Zellweger), and his kids Howard (Patrick Louis), Jay (Connor Price) and Rosemarie (Ariel Waller). He still fights, but for low purses and without success. 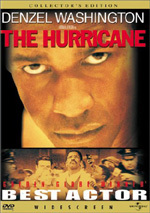 Eventually boxing promoter Jimmy Johnston (Bruce McGill) revokes Braddock’s license and leaves the boxer with no options other than to scrounge for manual labor along with scores of other guys. Howard seems like one of the nicest people in Hollywood, and he does create good movies much of the time. He just lacks the panache or punch to do anything inventive or genuinely impressive. To be sure, I dig flicks like Apollo 13 and others, but I can’t favorably compare Howard’s best to the top efforts of his notable contemporaries. On this two-sided disc, we get a mix of extras. 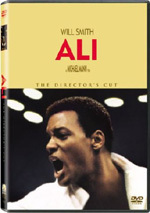 Side One features three separate audio commentaries. The first comes from director Ron Howard, as he gives us a running, screen-specific discussion. I wouldn’t call Howard a scintillating speaker, but he covers his work in a full manner. As we move to Side Two, we launch with seven Deleted Scenes. This area opens with an introduction from Howard, as he gives us an overview of the material. From there we find 21 minutes of footage. In these clips, we see: more with Jim and Joe in his salad days; desperation in the work line; Jim and Joe talk about his future; an extended version of Jim’s attempt to hide his broken hand; the Braddocks stand in the bread line; Jim sells his shoes; and Jim reads Roosevelt’s inauguration speech over a montage of work-related bits.